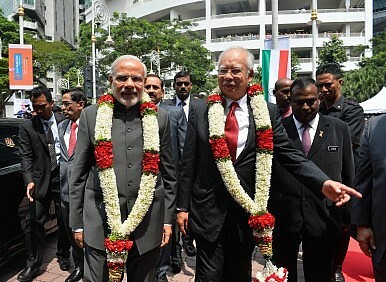 In Malaysia and Singapore, Modi addressed Indian expatriates and rallied them with his call for a greater Indian profile in global affairs, a message he has often repeated in front of similar crowds while on other foreign visits. Indians make up the third largest ethnic group in the city-state, after the Chinese and Malay ethnic groups. Of Malaysia’s total population of nearly 30 million, two million people are of Indian origin. While and trade and investment remain central to India’s outreach to Southeast Asia, the larger strategic context should not be lost sight of as India engages with the region. With his recent visits, Modi has succeeded in enhancing strategic partnerships with Malaysia and Singapore but New Delhi needs to engage with the region as a whole more substantively. New Delhi needs to assure the regional states of its reliability not only as an economic and political partner, but also as a security provider. As the regional balance of power in Asia changes and as the very coherence of the ASEAN comes under question, there will be new demands on India. The rapid rise of China in Asia and beyond is the main pivot even as Delhi seeks to expand economic integration and interdependence with the region. India is also developing strong security linkages with the region and trying to actively promote and participate in regional and multilateral initiatives. States in the region are now looking to India not only as an attractive engine for regional growth but also as a balancer in view of China’s growing influence and America’s preoccupations elsewhere. It remains to be seen if India can indeed live up to its full potential, as well as to the region’s expectations.